One of the great things about dressing up as a zombie is that you can easily make your own costume up with some of your old clothes, but I must admit sometimes it’s nice to get a costume that’s already made for you. On this post I’ve compiled a collection of ready made zombie costume ideas for women for you to enjoy. I’ve selected a few zombie costumes which I think are great and they leave you to concentrate on things like how you’re going to do your make up – grey complexion or green complexion, just face paint or liquid latex special effects? There’s so many different decisions to make why worry about also having to make your own costume! 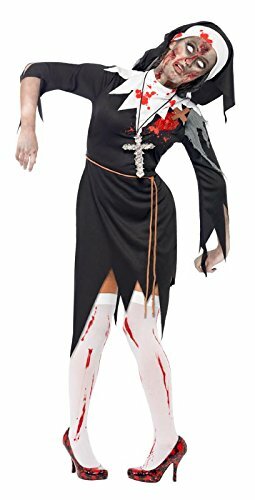 Although the most common options for women to dress up as zombies there are no zombie nurse costumes or zombie bride costumes on this page, not that they aren’t cool costume ideas, but just that I wanted to show you a little more of the variety available. The Wizard of Oz Just Got Zombified! Just what happens when you follow the yellow brick road and instead of leading you to the magical Oz it leads you right into an ambush by zombies, will Dorothy ever make it home ………. does she even remember where home is now that she’s a zombie? This Dorothy costume includes the dress and apron with a latex chest piece which is what really adds the ‘horror’ to this costume. The thigh high blood stained stockings are available separately and I do think they add a certain something although if you have other stockings or leggings to wear instead that’s fine. You can have a lot of fun with your hair using a lot of backcombing, hairspray and some grey temporary hair color or you can choose a wig. If you’re going with a partner I have seen some evil looking zombie scarecrow masks which you could combine with a scarecrow costume for a cool couples outfit. 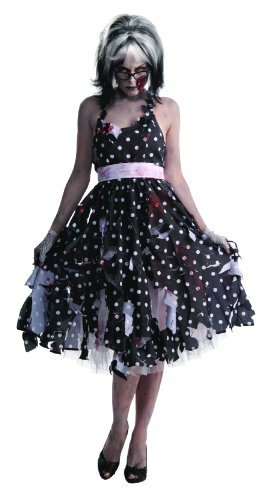 If you love the 50s or just the polka dot dresses of the era then this could be a cool costume idea for you – 50s housewife meets zombie, it’s a movie waiting to be made! The costume includes the dress and crinolene underneath which I think really adds to the style as well as the belt. You could pair this with just some plain black shoes or get some white blood stained high heels either would look great. I do love how the model has paired 50s styled cats eyes glasses with the outfit and I think that really sets it off so I would definitely look at getting a pair as well. Just what was the Mad Hatter serving at his tea party is what I would like to know. Quicker than the Queen of Hearts could say ‘Off with their heads’ the guests were morphing into zombies. Yes, despite infections only being caused by zombie bites on some movies or television shows there are other ways that you can spread a zombie infection and hidden inside a ‘specially brewed’ tea is one of them as Alice can attest. This costume includes Alice’s bloodstained dress, her must have hair bow and the arm bands. I think if you can get an old tea pot and tea cup to carry around it will definitely add to the costume however. If you’re going as part of a couple then I think getting a Mad Hatter costume could work really well if you add zombie face paint to it! Oh Father Who Art In Heaven……. If you thought nun costumes were too passe then you haven’t see this nun costume! I think that God has forsaken this particular bride of his as she’s become infected with the zombie virus and not even holy water can help. The costume includes the nun’s habit complete with a latex wound, a rope belt and the head dress. You can buy the bloodstained thigh high stockings separately, but personally I don’t think it needs them – let’s be honest just because her habit has ripped as she lurches around and is now much shorter than it should be doesn’t mean she’d be wearing stockings! Hi I’m Louanne from Everything Halloween, welcome to my blog! I just wanted to let you know that this post may contain affiliate links which means, at no cost to YOU, that I might receive compensation if you purchase something through a link on my site. In the online world this is called ‘affiliate marketing’ and is a very common way that bloggers make their money, if you want to find out more then check out this post to find out what is affiliate marketing and how we make money on this site, If you want to see my full affiliate disclosure and the other ‘legal stuff’ then click here. This entry was posted in Costumes, Women's Costumes and tagged zombie costume ideas by Lou. Bookmark the permalink.